At the annual dinner there will also be a meeting of the members of The Princeton Area Alumni Association which will include the election of 6 Directors to serve for a term of 3 years starting July 1, 2010. Please feel free to nominate yourself or another member for these positions by sending an e-mail together with a brief biographical write-up to Kristin C Epstein, President at princetonareaalumni@gmail.com no later than January 5, 2010. Semi-Formal Attire, Orange and Black always welcome! Please RSVP by Friday, January 8th, 2010, Reservations will be held at the door. Click here to view the response card. A group of PA3 volunteers - a strong core of regulars and a couple of newcomers - went to Isles on a chilly morning, this time to remove weeds and debris outside the Johnston Avenue building. 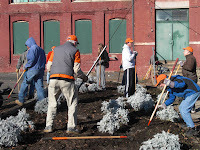 After a tour of the transformed interior, the crew set to work clearing beds and removing trash. A big thank you to everyone for taking time during the busy holiday season to help out! With performances by the Nassoons, Tigertones, Tigressions, Shere Khan, Roaring 20, Wildcats, Kindred Spirit, Tigerlilies, Katzenjammers, Footnotes and the PU Band! Free hot cocoa and cider will be served to keep you warm. Bring a new toy to brighten up a child’s life! 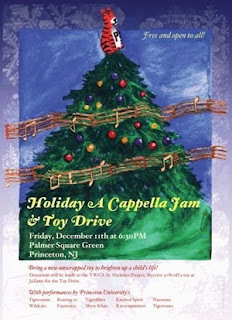 Attendees are encouraged to bring an unwrapped toy that will be donated to the YWCA Princeton St. Nicholas Project. The St. Nicholas Project aims to help parents who would otherwise be unable to create the magic of Christmas for their children. Most needed are stackable toys, building blocks, shape sorters, lacing cards, matching games or beginning games for early skill levels (i.e. Perfection, Chutes and Ladders, Candyland). Books and art supplies are always a favorite. Non-toy donations will also be accepted. 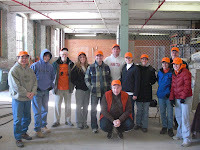 For more information on the St. Nicholas Project, visit http://www.ywcaprinceton.org/polAnnouncements.cfm?doctype_code=Announcement&doc_id=1228. JaZams toy shop at 25 Palmer Square East is offering a special 20% discount to any toy purchased for the toy drive. Donations will be collected at the store at the time of purchase. Discount valid through December 11.